I ended up going home from work early yesterday. I had finished everything I NEEDED to get done, and there was no sense in me sitting around waiting for the phone to ring feeling like crap. So I went home and spent an hour or so on the couch catching up on DVRed episodes of Revenge (anyone seen that? I’m loving it!) before I couldn’t sit on the couch and do nothing any longer. I went to the kitchen and grabbed my bag of apples, my peeler and two bowls so I could start peeling apples. 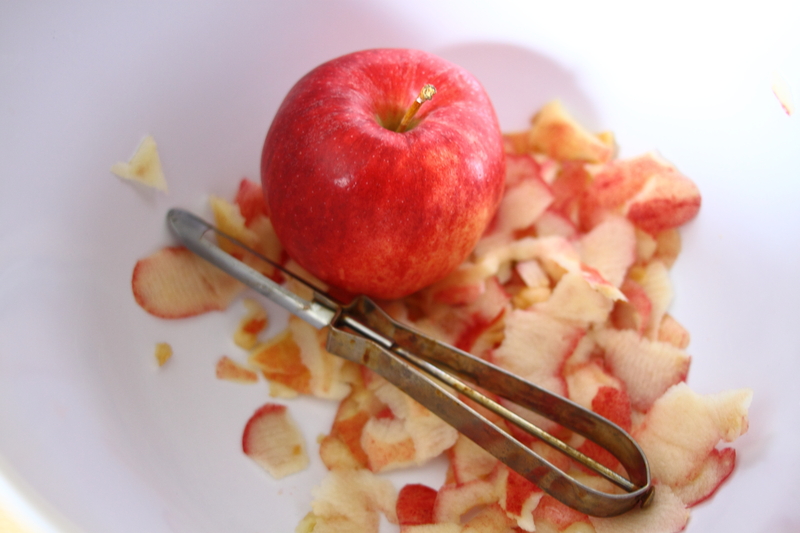 And then, like a good sickie, I got back on the couch…and peeled apples. 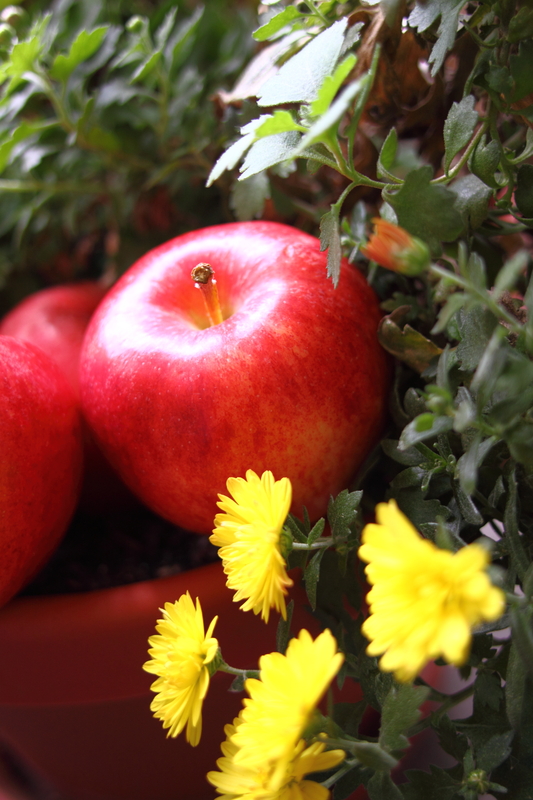 I had a package of approximately 8 gala apples, although most recipes will tell you to use different types of apples. I used what I had on hand, but you could probably use just about any kind. 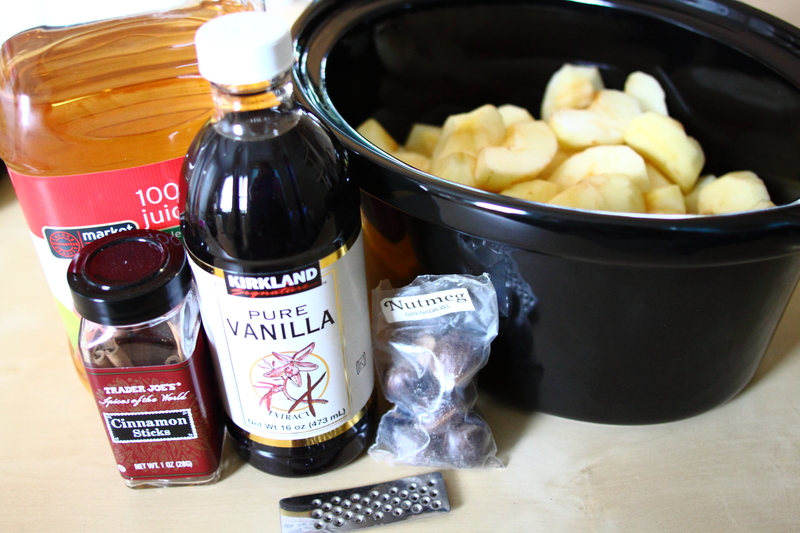 I put the apples, peeled, cored and roughly sliced into the crock pot with 1 stick of cinnamon, a splash of pure vanilla, a slightly larger splash of 100% apple juice and a good sprinkling of fresh grated nutmeg. Personally, I would have liked a little more cinnamon flavor, so maybe next time I’d use two sticks…or maybe grate some of the first one in before I put it in the pot. I set the timer for 5 hours on low heat, but I left them in for an extra half hour because they weren’t quite soft enough for me by then. And we weren’t quite done with dinner either, so it worked out. When it was time to take them out, I mashed them roughly with a fork because we like our applesauce a little on the chunkier side. Speaking of dinner, we have now arrived at the compromising part of the program. I have said before that on occasion, I’ll cook meals with imitation meat products or without meat altogether. This would lead one to believe that Jim does all the culinary compromising. I made chicken pot pie, which is one of Jim’s favorites (and also, I’ll add 100% NOT healthy…another compromise on my part). The thing about me and my (mostly) vegetarianism is that I’m not picky…well, actually, I guess I am…in the sense that I don’t mind picking meat out or off of my food. I don’t like to do it because I feel it displays bad manners when at a table with other people, but I do it as discreetly as possible, and at home, I hae no qualms with picking my chicken out of my pie and flicking it onto Jim’s plate. He polished off about half of the pie all by himself (he’s 6’4, about 235 lbs and he has a job that keeps him moving all day. Feeding him is probably akin to feeding a team of high school football players). I had a decent sized piece myself, having saved room in my day’s caloric intake for the occasion. 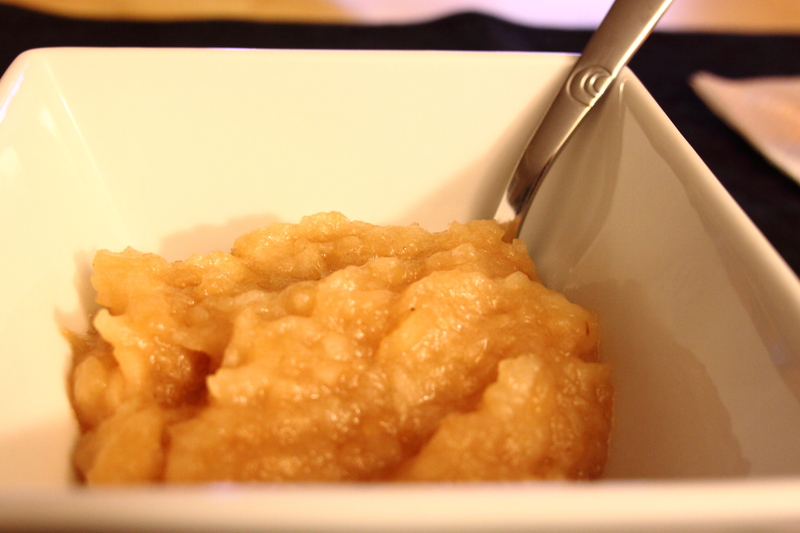 And we capped the meal off with a small bowl of delicious applesauce. Combine the butter and onions in the bottom of a largish saucepan. Cook until the onions are soft, about 2 mins. Stir in the flour and the spices. Stir in the milk and the broth to the flour and butter paste. Once it’s thickened to a nice sauce (2-3 mins), add the chicken and the vegetables. Unroll the crust and lie it in a pie dish. Pour the chicken and veggie mixture into the crust. Unroll the top crust and lie it gently on top. I’m no good with pie crust. I’ll admit it. At this point I just sort of squeeze the two crusts together and I’m okay with the messy looking edges it leaves. Do your thing here. Also, cut a few slits in the top to let air escape. Bake the whole thing (I’d recommend putting it on a baking sheet because sometimes it gets bubbly and oozes over) for about 30 minutes at 425 degrees, covering the edges of the crust with foil for the last ten or so to avoid burning them. 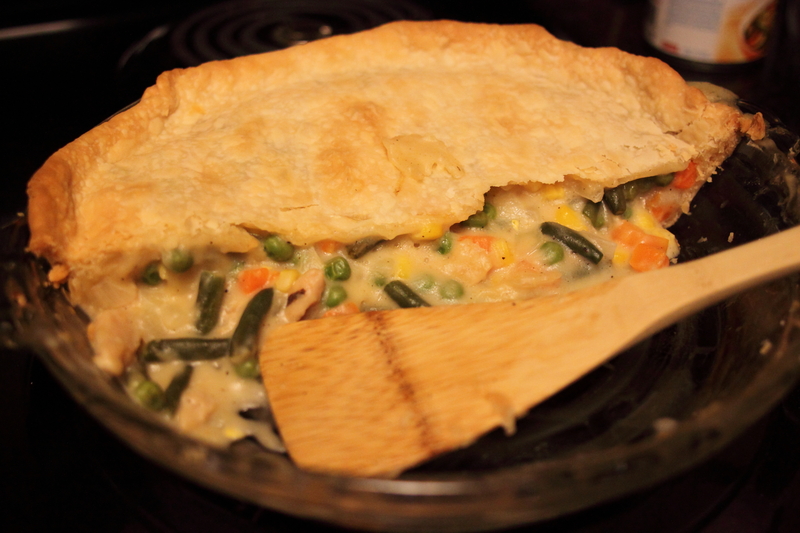 This pot pie tastes a little bit like childhood. It is DEFINITELY a comfort food, which I needed last night, along with the fire I lit in the fireplace (our first of the season), and the pumpkin ale we had with it. Do you make food compromises in your relationship? What is your favorite thing about fall?